We hit a bitter cold front and that calls for something warm and hearty! 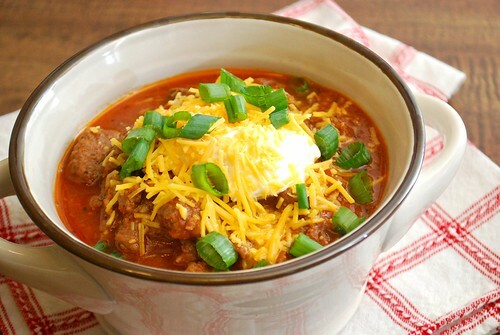 On the menu is this Steakhouse Texas Chili which is loaded with smoky bacon, seasoned ground beef, bites of chuck roast and topped with all the fixings. What you won't find in this chili are any beans! My family isn't big on real spicy chili with heat, so to appeal to their palates, I use a combination of everyday spices and chili powder. I also use both chuck roast and ground beef so it's meaty and satisfying for my boys. Bacon is another great addition and I used a really smoky bacon to impart more flavor - however any bacon will do. As a nod to steakhouses, I also added some Worchestershire and A1 steak sauce to enhance it overall. Lastly, the brown sugar is just enough to give it a bit of sweetness! Plug in Instant Pot and press SAUTE. Add bacon and cook until slightly crispy then add garlic and onion, cooking until softened. Add chuck roast and brown. Once chuck roast has browned, add ground beef, chili powder, garlic powder, onion powder, cumin, salt, diced tomatoes, broth or stock, Worchestershire sauce, steak sauce and brown sugar. Stir to combine. Press KEEP WARM/CANCEL to stop the saute setting. When the IP beeps after pressure cooking for 15 minutes, allow your IP to naturally release pressure for 10 minutes. While naturally releasing pressure, the display will reflect numbers counting up from 1. The numbers indicate how many minutes the IP has stopped cooking since it beeped (or how many minutes it has been naturally releasing pressure). No need to touch your IP while it naturally releases pressure. When the display reflects 10 (which is 10 minutes since the IP has beeped), turn the setting on top of your IP to VENTING. Doing so allows the IP to quickly release pressure. I use a wooden spoon to carefully turn the setting to avoid close contact with the potential steam. You may also want to turn your IP away from cabinets to allow the released steam to escape freely. The pin at the top of your IP will drop when all pressure has been released and it's safe to open. Open up your IP when the pin has dropped (allow a few minutes for this to happen) and stir. Press SAUTE and allow your chili to simmer and thicken to your preference. Serve topped with your favorite chili toppings - we love ours topped with sour cream, green onions, and shredded cheese, with a side of corn chips! What Steak Sauce are you using? Made this tonight. Tasted great. Thanks! Could not believe I didn't have any steak sauce, so used honey bourbon BBQ sauce instead and the chili was delicious!